Distillation may be carried out in plate columns in which each plate constitutes a single stage, or in packed columns where mass transfer is between a vapour and liquid in continuous countercurrent flow. Plate columns are now considered, and packed columns are discussed in Section 11.11. (a) The type of plate or tray. (b) The vapour velocity, which is the major factor in determining the diameter of the column. (c) The plate spacing, which is the major factor fixing the height of the column when the number of stages is known. Design methods are discussed later, although it is first necessary to consider the range of trays available and some of their important features. The main requirement of a tray is that it should provide intimate mixing between the liquid and vapour streams, that it should be suitable for handling the desired rates of vapour and liquid without excessive entrainment or flooding, that it should be stable in operation, and that it should be reasonably easy to erect and maintain. in many cases, particularly with vacuum distillation, it is essential that the drop in pressure over the tray should be a minimum. (a) Cross-flow. Normal, with a good length of liquid path giving a good opportunity for mass transfer. (b) Reverse. Downcomers are much reduced in area, and there is a very long liquid path. This design is suitable for low liquid-vapour ratios. (c) Double-pass. As the liquid flow splits into two directions, this system will handle high liquid-vapour ratios. The liquid reflux flows across each tray and enters the downcomer by way of a weir, the height of which largely determines the amount of liquid on the tray. The downcomer extends beneath the liquid surface on the tray below, thus forming a vapour seal. The vapour flows upwards through risers into caps, or through simple perforations in the tray. The bubble-cap tray. This is the most widely used tray because of its range of operation, although it is being superseded by newer types, such as the valve tray discussed later. The general construction is shown in Figure 11.51. The individual caps are mounted on risers and have rectangular or triangular slots cut around their sides. The caps are held in position by some form of spider, and the areas of the riser and the annular space around the riser should be about equal. with small trays, the reflux passes to the tray below over two or three circular weirs, and with the larger trays through segmental downcomers. Sieve or perforated trays. These are much simpler in construction, with small holes in the tray. The liquid flows across the tray and down the segmental downcomer. Figure 11.52 indicates the general form of tray layout. Valve trays. These may be regarded as a cross between a bubble-cap and a sieve tray. The construction is similar to that of cap types, although there are no risers and no slots. It may be noted that with most types of valve tray the opening may be varied by the vapour flow, so that the trays can operate over a wide range of flowrates. Because of their flexibility and price, valve trays are tending to replace bubble-cap trays. Figure 11.53 shows a typical tray. These three types of trays have a common feature in that they all have separate downcomers for the passage of liquid from each tray to the one below. There is another class of tray which has no separate downcomers and yet it still employs a tray type of construction giving a hydrodynamic performance between that of a packed and a plate column. Two examples of this type of device are the Kittel plate and a Turbogrid tray(53). Design data for these trays are sparse in the literature and the manufacturer's recommendations should be sought. (a) Liquid and vapour velocities. (b) Physical properties of the liquid and vapour. 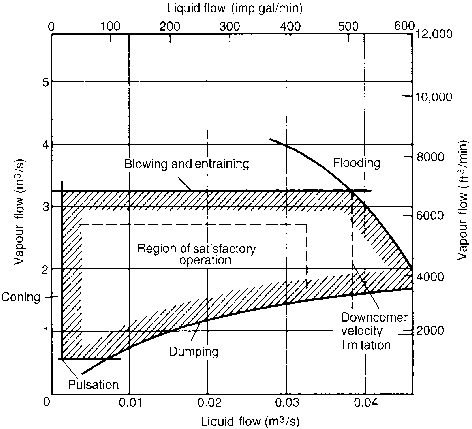 (c) Extent of entrainment of liquid by rising vapour streams. (d) The hydraulics of the flow of liquid and vapour across and through the tray. (a) For all plate spacings the efficiency EMv, which is defined in equation 11.124 as the ratio of the actual change in liquid composition on a plate to that which would be obtained if the liquid left in equilibrium with the vapour, decreases as the velocity is increased due mainly to the reduction in contact time between the phases. (b) The decrease in efficiency is much less with high plate spacings. (c) The capacity is limited by the ability of the downcomers to carry the reflux, rather than that of the caps to handle the vapour. The effects of liquid viscosity on tray efficiency have been studied by Drickamer and Bradford(58) and 0'Connell(59) and these are discussed in Section 11.10.5. Surface tension influences operation with sieve trays, in relation both to foaming and to the stability of bubbles. undesirable phenomena occur. Coning occurs at low liquid rates, where the vapour forces the liquid back from the slots and passes out as a continuous stream, with a consequent loss in efficiency. Low vapour rates result in pulsating vapour flow or dumping. With low liquid rates, vapour passes through the slots intermittently, though with higher liquid rates some slots dump liquid rather than passing vapour. Both pulsating vapour flow and dumping, which may be referred to jointly as weeping, result in poor efficiency. At very high vapour rates, the vapour bubbles carry liquid as spray or droplets to the plate above, giving excessive entrainment. With high liquid rates, a point is reached where the drop in pressure across the plate equals the liquid head in the downcomer. Beyond this point, the liquid builds up and floods the tray. The extent of entrainment of the liquid by the vapour rising over a plate has been studied by many workers. The entrainment has been found to vary with the vapour velocity in the slot or perforation, and the spacing used. Strang(60), using an air-water system, found that entrainment was small until a critical vapour velocity was reached, above which it increased rapidly. Similar results from Peavy and Baker(61) and Colburn(62) have shown the effect on tray efficiency, which is not seriously affected until the entrainment exceeds 0.1 kmol of liquid per kmol of vapour. The entrainment on sieve trays is discussed in Section 11.10.4. The design of the tray fittings and the downcomers influences the column performance. It is convenient to consider this separately for bubble cap trays and sieve trays. In design, the important factors are the diameter of the tower, the tray spacing and the detailed design of the tray. In designing a column for a given separation, the number of stages required and the flowrates of the liquid and vapour streams must first be determined using the general methods outlined previously. In the mechanical design of the column, tower diameter, tray spacing, and the detailed layout of each tray is considered. Initially, a diameter is established, based on the criterion of absence from liquid entrainment in the vapour stream, and then the weirs and the downcomers are designed to handle the required liquid flow. It is then possible to consider the tray geometry in more detail, and, finally, to examine the general operating conditions for the tray and to establish its optimum range of operation. This approach to design is covered in detail in Volume 6 where the different methods applicable to bubble caps, sieve trays and valve trays are discussed in detail. Bubble-cap trays are rarely used for new installations on account of their high cost and their high pressure drop. In addition, difficulties arise in large columns because of the large hydraulic gradients which are set up across the trays. Bubble cap trays are capable of dealing with very low liquid rates and are therefore useful for operation at low reflux ratios. There are still many bubble-cap columns in use and the design considerations presented in Volume 6 are given to enable, in particular, existing equipment to be assessed for new applications and duties. Sieve trays offer several advantages over bubble-cap trays, and their simpler and cheaper construction has led to their increasing use. 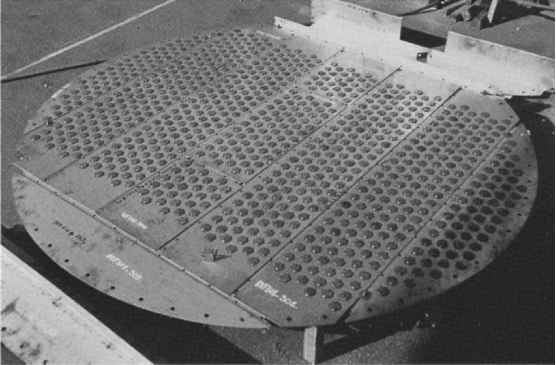 The general form of the flow on a sieve tray is typical of a cross-flow system with perforations in the tray taking the place of the more complex bubble caps. The hydraulic flow conditions for such a tray are discussed in Volume 6 in the same manner as for the bubble-cap tray, by considering entrainment, flooding, pressure loss, and so on. The key differences in operation between these two types of tray should be noted. With the sieve tray the vapour passes vertically through the holes into the liquid on the tray, whereas with the bubble cap the vapour issues in an approximately horizontal direction from the slots. With the sieve plate the vapour velocity through the perforations must be greater than a certain minimum value in order to prevent the weeping of the liquid stream down through the holes. At the other extreme, a very high vapour velocity leads to excessive entrainment and loss of tray efficiency. The capacity graph for a sieve tray is similar to that shown in Figure 11.54 for bubble cap trays. The valve tray, which may be regarded as intermediate between the bubble cap and the sieve tray, offers advantages over both. The important feature of the tray is that liftable caps act as variable orifices which adjust themselves to changes in vapour flow. The valves are either metal discs of up to about 38 mm diameter, or metal strips which are raised above the openings in the tray deck as vapour passes through the trays. The caps are restrained by legs or spiders which limit the vertical movement and some types are capable of forming a total liquid seal when the vapour flow is insufficient to lift the cap. (a) Operation at the same capacity and efficiency as sieve trays. (b) A low pressure drop which is fairly constant over a large portion of the operating range. (c) A high turndown ratio, that is it can be operated at a small fraction of design capacity. (d) A relatively simple construction which leads to a cost of only 20 per cent higher than that of a comparable sieve tray. 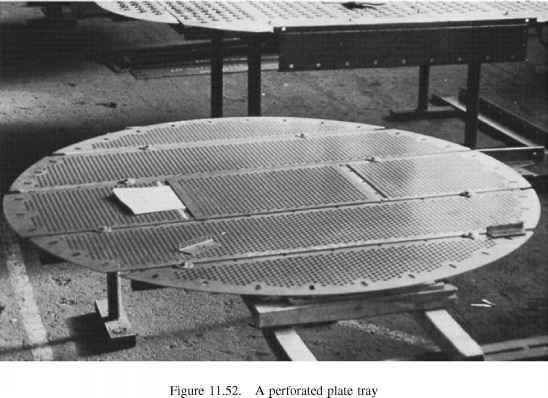 Valve trays, because of their proprietary nature, are usually designed by manufacturers, although it is possible to obtain an estimate of design and performance from published literature(63) and from the methods summarised in Volume 6. What is a downcommers n tower? What is the space between two plates in a distillation colomn? How to install valve tray? 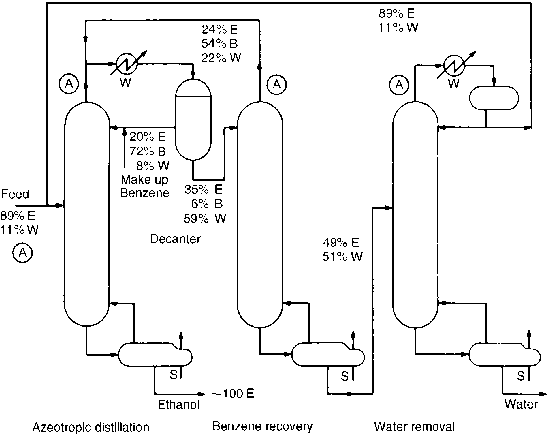 How to calculate reflux ratio distillation plate? Is the reflux ratio for columns usually high? How to make a plated columb? How find the plate in distillation collumn? How does a FullReflux Plated Columns work? How does a plated reflux column work?